Entrance into the 2019 Leadville Trail 100 MTB lottery will be open from December 1-31, 2018. Winners will be notified in mid-January and automatically charged the $450 registration fee. You may register for the LT100 MTB Lottery as an individual or a group. A maximum of four family members, friends or teammates can click the group registration option. Group members will register individually, however using the exact group name to signify being part of a group. This will mean that either your entire group will be successful in the lottery or not. Assuring no one will be left out! Please note that if a member of your group has completed the LT100 MTB under the designated sub-12 hour cut-off seven or more times or they have volunteered 10+ hours in the 2018 season they will be forfeiting their guaranteed entry. In 1860, during the Pikes Peak Gold Rush, gold was discovered in California Gulch and the town of Oro City sprang up near present-day Leadville. The boom was brief, and Oro City never became a major settlement. The gold mining was hampered by heavy brown sand in the sluice boxes. In 1874, gold miners at Oro City discovered that the heavy sand that impeded their gold recovery was the lead mineral cerussite, that carried a high content of silver. Prospectors traced the cerussite to its source, and by 1876, had discovered several lode silver-lead deposits. The city of Leadville was founded near to the new silver deposits in 1877 by mine owners Horace Austin Warner Tabor and August Meyer, setting off the Colorado Silver Boom. 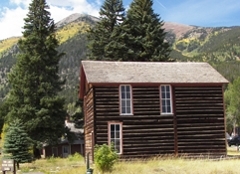 By 1880, Leadville was one of the world’s largest silver camps, with a population of over 40,000. Confederate scout, cowboy and stage actor with “Buffalo Bill” Cody’s traveling revue, Texas Jack Omohundro died here in the summer of 1880, of pneumonia, one month before his 34th birthday. He was living there on a small estate with his wife, ballerina Giuseppina Morlacchi. It was during this period that Leadville saw its most dangerous days, finally brought under control by little-known American Old West lawman Mart Duggan. Around 1883, outlaw Doc Holliday moved to Leadville, shortly after the gunfight at the O.K. Corral. On August 19, 1884, Holliday shot ex-Leadville policeman, Billy Allen, after Allen threatened Holliday for failing to pay a $5 debt. Despite overwhelming evidence implicating him, a jury found Holliday not-guilty of the shooting or attempted murder. In its early years, Leadville was the site of famous mining swindles. When the Little Pittsburg mine exhausted its rich ore body, the managers sold their shares while concealing the actual condition of the mine from other stockholders. “Chicken Bill” Lovell dumped a wheelbarrow of rich silver ore into a barren pit on his Chrysolite mining claim in order to sell the claim to Horace Tabor for a large price. Tabor had the last laugh when his miners dug a few feet farther and discovered a rich ore body. Later, the manager of the Chrysolite mine fooled an outside mining engineer into overestimating the ore reserves of that mine. A bitter strike of hard rock miners in 1896-97 led to bloodshed, at least five deaths, and the burning of the Coronado Mine. The city’s fortunes declined with the repeal of the Sherman Silver Purchase Act in 1893, although afterwards there was another small gold boom. Mining companies came to rely increasingly on income from the lead and zinc. The district is credited with producing over 2.9 million troy ounces of gold, 240 million troy ounces of silver, 1 million short tons of lead, 785 thousand short tons of zinc, and 53 thousand short tons of copper. During World War II, Leadville was a popular spot for visits by soldiers at nearby Camp Hale, but only after the town acted to curb prostitution; until then, the United States Army declared the town off-limits for its personnel. An interesting side note: LT100 Race Headquarters at 213 Harrison Ave. in downtown Leadville had been the former home of a dry cleaning business during this time, and was considered to be the busiest dry cleaning operation in Colorado because all of the Camp Hale soldiers’ wool uniforms were cleaned there. The Army Air Forces built the Leadville Army Airfield northwest of the city. The war also caused an increase in the mining of molybdenum at the nearby Climax mine, which at one time produced 75 percent of the world’s molybdenum. The Leadville Historic District was designated a National Historic landmark District in 1961. It includes 67 mines in the mining district east of the city up to the 12,000 foot (3658 m) level, and a defined portion of the village area, with specific exclusion of various buildings. Principal historic buildings in the district are: Tabor Grand Hotel, St. George’s Church, Annunciation Church, Tabor Opera House, City Hall, Healy House, Dexter Cabin, Engelbach House, and Tabor House, as well as mining structures and small homes. Structures built after 1917 are considered non-contributing. The closing of the Climax mine in the 1980s was a major blow to the town’s economy. The town has made major efforts to improve its economy by encouraging tourism and emphasizing its history and opportunities for outdoor recreation. The National Mining Museum and Hall of Fame opened in 1987 with a federal charter. The town’s altitude and rugged terrain contributes to a number of challenging racing events, such as the Leadville Trail 100 series of races. it is often used as a base for altitude training and hosts a number of other events for runners and mountain bicyclists.